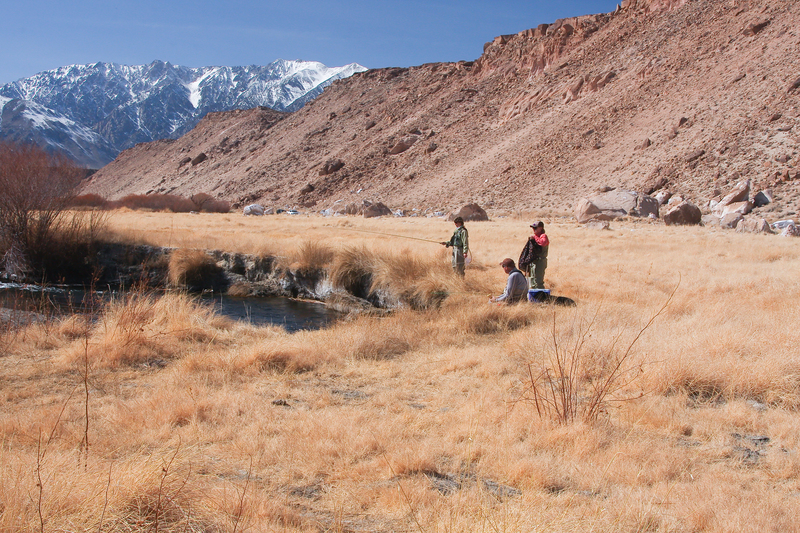 Come join us as we head to Bishop to start the trout fishing year. This is a great chance to get to know people in the club and improve you fishing skills. We’ll have a fantastic time on and off the water. Also if you are new to fly fishing this is a great chance for you learn more of the basics. We will offer an on the water session instruction for beginners. Contact Rod Hendrickson if you are interested. Accommodations: Hotel Cielo in Bishop. We have a group reservation for $95 a night you must call Hotel Ceilo at 760-873-6380 and reference Golden State Fly Casters; the number of rooms are limited, plus the reservations will only be held until Feb 1st. There are many other lodging options close the Hotel Ceilo. Ride sharing: I will try to pair people up to share rides and rooms please let me know if you are interested. Arrival- A good number of people will be arriving during the day, I should be in Bishop by late morning and will be heading straight out to the river to fish. If anyone would like to meet up on the river you can give me a call on my cell phone (619-370-2025) which I will have with me while fishing. Evening -Normally we meet up at the hotel lobby around five to six PM for a little happy hour where we go over the day’s events, have an adult beverage and figure out where people would like to go to dinner, in some cases different places due to preferences and the size of our group. After dinner we meet up in the lobby, maybe tie some flies. Morning- Meet up in the Breakfast room for breakfast around 6:30 to & 7:30 discuss exact fishing location options and for those new to the Owens pair up with someone to show you the ropes. Most people don’t head back to town for lunch so put together your lunch before heading out. We will have thirty to forty people there this weekend so periodically you’ll run into part of the group. Evening- People get back to the hotel around 5PM, get cleaned up a bit and meet up in the lobby/breakfast room for the nightly “Happy Hour” Joe Diko club member and Bishop resident is heading up the Saturday Fishing tournament. He will meet us to over details for the tournament. We hope everyone gives it a shot and participates; cost is $15 which includes your entrée at the dinner Saturday night. The Bowling Alley has a restaurant that has a Friday night prime rib special that a lot of people enjoy. Same routine after dinner. Morning- Meet for breakfast 6:30-7:30 and go over final details for the tournament; pay your $15, get your score card etc. Tournament is from 10:00-12:30. Fish the rest of the day where you like. Evening- We’ll meet back at the hotel at 5PM and turn in your score cards and get ready for the 6PM tournament dinner at Las Palmas Mexican restaurant. *Everyone is encouraged to come whether you participated or not, we have the large back room reserved. It should be a lot of fun for everyone. Morning- Meet for breakfast around 7AM and discus the day’s fishing and individuals departure times. Say your good bye’s and head out and get a few more hours of fishing in before you pack up and head home.